Every year around 100 Americans are killed as a result of being struck by lightning. 100 deaths from a common natural event may not seem like a lot considering over 300 million people live in the United States, but deaths from lightning are more common than hurricanes, tornadoes and forest fires. On average only flooding claims more lives than lightning. Lightning is dangerous and its power should be respected by people, especially those who spend time outdoors like hikers, boaters, golfers, athletes and the coaches responsible for their safety. Why Lightning is so Dangerous? Lightning is lethal due to the immense power it carries and the unpredictable nature of strikes. Each lightning strike may contain 100 million to 1 billion electrical volts and be as hot as 50,000 degrees Fahrenheit. That is enough power to instantly fry any living being and hot enough to spark an out of control fire. The deadliness of lightning is amplified by the erratic nature of strikes. Lightning usually strikes within a 10 mile radius of a thunderstorm but has been known to strike at a range of 50 miles from the main storm, putting people at risk that may be unaware of an impending lightning storm. What to do if stuck in a lightning storm? There are some safety measures you can take if you find yourself in the middle of a lightning storm. 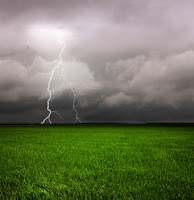 The best advice during a thunderstorm is to take shelter inside as soon as lightning is detected. If shelter is not an option you should stay away from high objects and avoid being the tallest object yourself. Steer clear of isolated trees, tall trees, telephone poles and metal objects. In the unfortunate event you are the tallest object, like in a field or body of water, attempt to crouch down to lessen your height. Do not lie flat on the ground as electrical charges can be felt through the ground at distances of 100 ft. from a strike. A car is a safe place to take shelter from a lightning storm. In the event of a strike, lightning will travel around the conductive metal surface then discharged through the tires. What Tools Can Protect You? Having the appropriate respect for lightning is the most important measure when considering lightning safety. Thunder is a direct result of lightning, so if you hear thunder that means you are at risk of being struck. Lightning detectors are able to identify electrical activity at distances before the threat of a strike. Golf courses, swimming pools, sports teams, boaters and storm chasers represent some of the groups that use lightning monitors to ensure outdoor safety. Scientific Sales Inc. features the P5-2 Skyscan Lightning Detector, capable of detecting lightning as far as 40 miles away. The P5-2 Skyscan lightning monitor warns those at risk using audible and LED alarms ranged in miles, 0-3, 3-8, 8-20, 20-40. 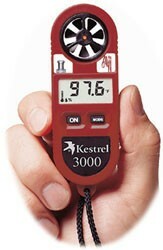 The hand-held lightning scanner is very reliable and perfect for people that spend time outdoors. Remember lighting is a powerful and unpredictable killer. The fact that 85% of lightning victims are under the age of 35, signifies that lightning is not fully understood or respected by Americans. Take cover at first sign of lightning, and invest in a lifesaving lightning detector if you frequent the outdoors. It just may save your life.